Absolute steal! £100 off RRP plus you get 100 free capsules, which being a Vertuo machine, is worth at least £43. 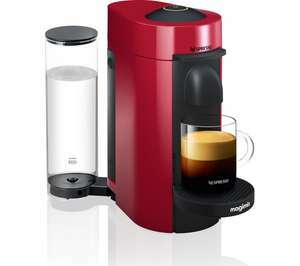 You wouldn't buy a coffee machine and no capsules so this effectively brings the price of the machine down to £36.99! Not available in-store, only online. My comment is similar to previous one. They only brought new machine out use new size capsules after lost second court case trying to stop other manufacturers making nespresso pods. Same coffee same taste. If u want larger coffee use 2 pods. Anyone gone from the old machines to these newer ones? How does the coffee compare? Apart from being more expensive. It's like buying a printer that only works with ink supplied by the manufacturer. I'm surprised they're not giving these away for free so they can start making money out of coffee again. Good deal but shame it's the new pod version. Anyone gone from the old machines to these newer ones? How does the coffee …Anyone gone from the old machines to these newer ones? How does the coffee compare? Apart from being more expensive. I had an old machine. Was good. But this is on a whole other level. The coffee is really good. I buy the mug size pods on subscription - I've got no problem being tied to a sub, as I use about 100 pods a month with the missus. Costs about 50p a cup of coffee. I couldn't go back to the original machine. I considered buying one of these when they were released when they were £200, but I thought it was ridiculous thatb you can't set how big a drink you want; it's determined by the capsule. One particular flavor I liked HAD to be vended to 410ml (IIRC). So if I wanted that particular flavour, I had to have nearly a pint of it! Bought a bean to cup instead which is far cheaper to run and more versatile. You don't even have to load a capsule each time. I considered buying one of these when they were released when they were …I considered buying one of these when they were released when they were £200, but I thought it was ridiculous thatb you can't set how big a drink you want; it's determined by the capsule. One particular flavor I liked HAD to be vended to 410ml (IIRC). So if I wanted that particular flavour, I had to have nearly a pint of it!Bought a bean to cup instead which is far cheaper to run and more versatile. You don't even have to load a capsule each time. Which bean to cup did you buy? @D87C De"Longhi ESAM from Argos. Often mentioned on HukD and can be bought for around £170 from Argos when they drop the price. Happens a few times a year. You can definitely change the quantity of water vended with this one as I've got one! If you press the button it stops the vending at that point so, you get the size of coffee you want. I can strongly recommend this. Coffee is much nicer. Not used the old Nespresso machine since. My comment is similar to previous one. They only brought new machine out …My comment is similar to previous one. They only brought new machine out use new size capsules after lost second court case trying to stop other manufacturers making nespresso pods. Same coffee same taste. If u want larger coffee use 2 pods. I disagree. The mechanism of making coffee is very different and the larger drinks taste different to simply using 2 pods of the older system. You also have the benefit of getting the precise volume brewed/dispensed. The capsules are really dry when they come out, so no horrible dripping and constant cleaning. Saying that, I haven't purchased one due to the very high pod cost. I cannot justify paying 50p per coffee when I can get L'or aluminium pods for 12p each. We get through around 10-12 pods a day. This is a good review of the system, albeit the slightly more fancy plus model. How do you get L'Or pods for 12p please? Cheapest I found was in Iceland Warehouse for 15p but limited offer. It is for work, so can sometimes be a bit more. I pay for the drinks in an effort to support the team. So every penny counts. Plus I am discovering the fun of a Moka pot after buying one of these. Posted in another thread but you don't need to buy the original pods, just an adaptor then refill the used pods with the coffe of your choice. How do you get L'Or pods for 12p please? Cheapest I found was in Iceland …How do you get L'Or pods for 12p please? Cheapest I found was in Iceland Warehouse for 15p but limited offer. They were £17.99 for 100 caps on Amazon recently, with a 15% voucher across all the varieties. Then 15% off for S&S. 30% off £17.99 was £12.59. I purchased a 100 cap set of all varieties on my account and then repeated the purchases on my partners account. Now I have 1600 caps sitting in my garage! Should hopefully last a while. The offer comes around regularly. Last year I actaully paid £11 for 100 caps, so this year was a bit more expensive. They were £17.99 for 100 caps on Amazon recently, with a 15% voucher …They were £17.99 for 100 caps on Amazon recently, with a 15% voucher across all the varieties. Then 15% off for S&S. 30% off £17.99 was £12.59. I purchased a 100 cap set of all varieties on my account and then repeated the purchases on my partners account. Now I have 1600 caps sitting in my garage! Should hopefully last a while. The offer comes around regularly. Last year I actaully paid £11 for 100 caps, so this year was a bit more expensive.